Compassion and charity have never been enough to address the realities plaguing a society’s most vulnerable citizens long-term. Efforts toward obtaining a living wage, developing more affordable, secure and safe housing, ending community violence and law enforcement brutality, and protecting the rights of people experiencing homelessness must be transformative for lasting change. How we address poverty and its emerging issues, and all forms of oppression is measurement of how we see ourselves in relation to each other in community as neighbors, and ultimately as fellow human beings. In 1956 as he prepared for the Montgomery bus protests, Dr. King delivered his sermon “On Being a Good Neighbor” and identified our neighbor as “Anyone who lies in need at life’s roadside.” As he reflected on the issues of the day, he asked his listeners, “What would happen if we do not take a stand?” That question is still pertinent today, as we reflect on the Trayvon Martins, the Sandra Blands, the victims of gun violence, the growing number of children without permanent housing, and the women and men burdened with fines and arrest records for inhabiting public spaces. These are a few of our neighbors who can be counted among the most vulnerable and in need. Unfortunately, it seems that we sometimes struggle with what it means to be a good neighbor to those who are like us, and much too often to those who are not like us. Maybe we feel powerless, are fearful, blame the victimized, or have been lulled into complacency and passivity. Fortunately, history bears witness to what committed people awaken to the call for greater humanity can accomplish. As we engage in activities across the nation commemorating the life of Dr. Martin Luther King, Jr, two questions arise, “How open are our ears, minds, and hearts to today’s voices echoing his call for social and economic justice? 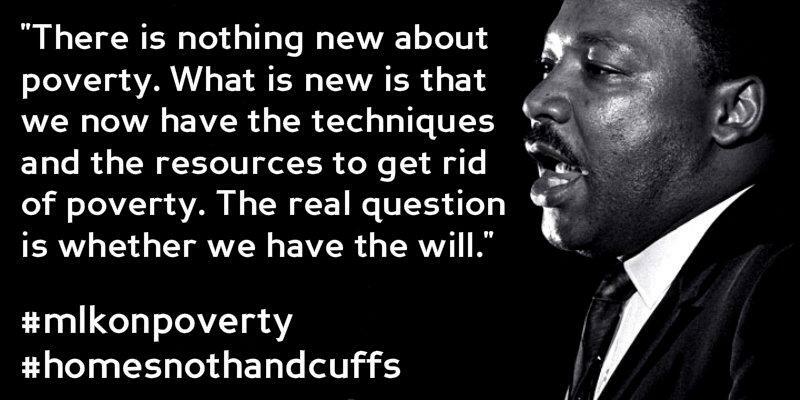 And, what are we willing to do to get it done?” Dr. King’s question nearly sixty years ago allows us to individually and collectively identify if we can be counted among the active participants to bring about change for our day. This year as we celebrate his life and legacy let us become awaken to the call for justice in new ways. Whether we find ourselves involved in community, seated at tables of power, members of faith communities, or on social media, let us shake the trees of fear, complacency and passivity with active involvement in causes and movements that seek solutions. Let us be active for change, and by doing so take a stand that reflects the essence of being a good neighbor. Guest Post: Living in a Storage Unit – How Common Is It? Living in a self-storage unit is neither safe nor legal, but it does occur – for a variety of reasons. According to a SpareFoot survey of nonprofits that help the homeless, it’s unusual but not unheard of. Homeless people typically rent storage units to keep their most precious belongings safe and to preserve what they can of their former life, according to Stoops. For the survey, SpareFoot contacted 100 homeless services organizations in the country’s 50 most populated metro areas. SpareFoot received 41 responses from nonprofits in 30 of those metro areas. The organizations that responded to the survey serve more than 120,000 people a year. Most provide emergency shelter, and many also provide transitional and long-term services, such as job training and health care. The survey results: Five organizations (12 percent) responded that current or recent clients had lived in a storage unit and reported 14 such cases within the past three years. Five more responded they’d heard about people doing this, but had no specific reports from current or recent clients. The remaining 31 (76 percent) had not heard of people living in storage units. To read the entire blog post, visit Sparefoot.com. 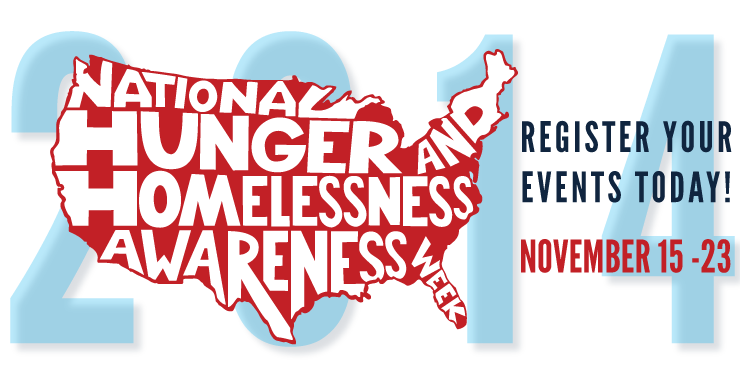 Planning events for National Hunger and Homelessness Awareness Week can seem daunting. What will you do? Will the events be oriented towards service or education? How do you know that you are planning the right type of event? These are all common questions when starting the planning process, but the most important thing to remember is that you are not alone. Last year, over 750 high schools, colleges, community groups, and faith-based organizations nationwide hosted events including clothing drives, speaking engagements, educational films, and voluntarily nights without a home to understand the struggles related to the experience of homelessness. Now it is your turn to look at the impacts of poverty around you, educate yourself, and call your communities to action to help end hunger and homelessness! The planning process must start off with two major elements. The first is a team to brainstorm and execute programs. Bring together individuals from different backgrounds who share an enthusiasm for helping to end poverty. Volunteers can be individuals who donate their time to their local soup kitchen, community leaders, and individuals who are or have experienced homelessness. Their commitment to the cause will be a part of everything you do and show others why they too should become involved. The second is a theme. It may be cliché, but the theme is everything! It helps you to clarify your goals and prevents your programming from becoming muddled. This year, the National Coalition for the Homeless (NCH) is encouraging groups to focus on youth homelessness, in honor of the launch of the National Campaign for Youth Shelter. With only 4,000 shelter beds for as many as 500,000 young people (16-24 years old), NCH recognizes that the time has come for us all to fight for more safe shelter for vulnerable youths in our communities. No matter what aspect of poverty you choose to highlight, a unifying theme is a way to bring your passions and ideas together to make your week a success! National Hunger and Homelessness Awareness Week is dedicated to education and awareness about poverty-related issues within our local communities and across the nation. Poverty has many different causes and there are a variety of factors affecting those experiencing poverty and homelessness today. It is wise to think outside of the box and go beyond stereotypes to create awareness programs that are diverse, unique, and creative. An important element to planning an educational program is to know your audience. On a college campus, students embrace volunteerism and enjoy making toiletry kits, trail mix packs on-the-go, and sandwiches. Your local community group may want to organize a clothing drive or Oxfam Hunger Banquet while your faith-based organization can host a round table discussion to discuss poverty, its causes, and how it can be eliminated. Engage your community! Some of the most prevalent needs may be around the corner. Rather than make assumptions, see what your local soup kitchen or community center needs. If you invite a speaker, invite someone who is local and can share experiences within the community. Engagement with local organizations and individuals has the potential to establish long-lasting relationships and service opportunities that can extend your efforts beyond H&H Week. The National Coalition for the Homeless can provide you with many more ideas for events and educational resources. Check out the 2014 manual to be inspired. Hunger and Homelessness Awareness Week brings people together from across the country to educate and promote change for some of the country’s most dire issues. You can be a part of this movement and help your community become a part of the solution. Planning your events is the first step to making hunger and homelessness a thing of the past. After you have planned your events, don’t forget to register them on the NCH website to become part of our national map and let participants in your area and across the country know what you are doing to celebrate Hunger and Homelessness Awareness Week 2014!